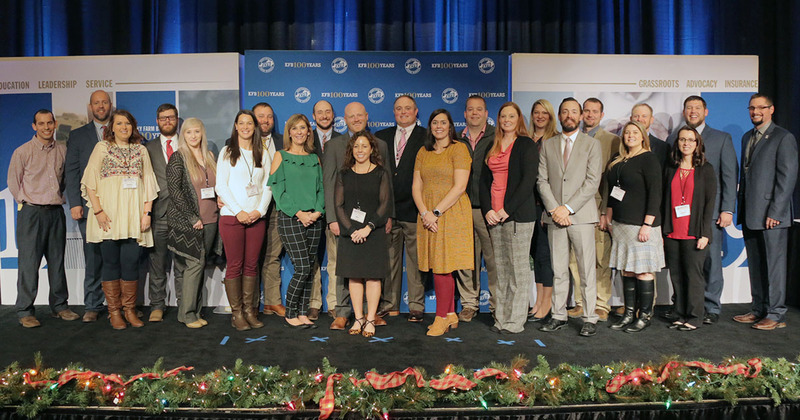 Louisville, KY (January 30, 2019) – More than 300 young farmers and farm families from across Kentucky are expected to gather this weekend for the Kentucky Farm Bureau (KFB) Young Farmer Leadership Conference at the Embassy Suites in Lexington. The Kentucky Farm Bureau (KFB) Young Farmer Leadership Conference will provide young farmers and their families an opportunity to hear from KFB leadership about a number of topics, tour interesting ag-related facilities and businesses, and to enjoy a weekend of fellowship and networking with farming families from across the state. The Kentucky Farm Bureau Young Farmer Advisory Committee poses for a picuture during the 2018 KFB Annual Meeting at the Galt House in Louisville, KY. The weekend conference begins on the morning of Friday, February 1st with a pre-conference tour of the Toyota Assembly Plant. Following the tour, participants are invited to attend a silent auction, an opening general session featuring Kentucky Commissioner of Agriculture, Ryan Quarles, and a young farmer hospitality session, all at the Embassy Suites in Lexington. Saturday’s events kick off with an “Eggs and Issues” Breakfast with KFB Director of Public Affairs Jeff Harper providing a legislative update regarding important state and national issues affecting agriculture. Following breakfast, attendees have an opportunity to participate in a variety of breakout sessions. Topics include Understanding Regulations, Adding Value to Your Livestock, and Drone Technology on the Farm, to name a few. There are also breakout sessions available specifically for children. Saturday’s luncheon will feature comments from Robert Alexander, Growing Forward Specialist, Farm Credit Mid-America and the remarks from Oscar Winning Radio and TV Broadcaster Andrew McCrea. Following an afternoon of learning from guest speakers about an array of topics related to agriculture in our state, the weekend conference will conclude with a grand finale event featuring Retired Army Ranger and Award-Winning Country Music Artist and Songwriter Mr. Keni Thomas.